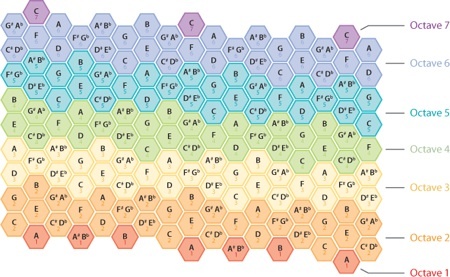 Rather than confine itself to one long string of keys, this novel keyboard interface uses hexagonal keys in a honeycomb pattern to arrange notes ordered according to a harmonic table. Called the Axis, this innovative MIDI controller is in commercial production. This is not a alternative tuning system, but an alternative keyboard. All twelve notes of the traditional Western scale fit into onto a 2-dimensional surface with a visible logical pattern. Starting from any note, the next note up-to-the-left is a minor third above the starting note. The next note directly above is a fifth above the starting note, and the next note up-to-the-right is a major third above the starting note. Semitones are in horizontal lines, like the semitone between Minor and Major 3rd. In this arrangement, a minor triad (three note chord) has the shape of a left-facing triangle, and a major triad has the shape of a right-facing triangle. The Harmonic Table pattern can be extended in all directions, and all intervals, chords and scales have the same shape in any key. See some chord shapes.